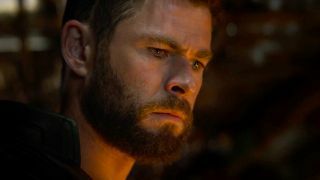 Fans think an MCU hero has been mysteriously edited out of the new Avengers: Endgame trailer – but why? Can you guess who’s missing in the new Avengers: Endgame trailer? In amongst all the excitement of the new Avengers 4: Endgame trailer that dropped last night, it felt like something was missing. No, not those who were snapped away in Avengers: Infinity War – though their absence was keenly felt – but another person entirely. In short, fans think Marvel Studios has pulled a sneaky edit to ensure a big spoilery superhero team-up (and possibly return from the dead) isn’t ruined. One of the scenes in question (H/T Polygon) includes an outdoor shot of Steve Rogers, Natasha Romanoff, Bruce Banner, and Rhodey all looking up at something. But it’s not the unseen thing we should be worried about – it’s the big gap between Banner and Rhodes. See that? There’s a bit of an obvious piece of empty space there, and not something directors as meticulous as the Russo brothers would just leave lying about to draw the eye. There’s even a second shot involving the group walking in the Avengers facility as the sun streaks across the screen. And it’s here where the plot thickens. Not only did this scene edit everyone out in the original Avengers: Endgame trailer, but there’s also another odd gap in the second trailer. There’s a chasm between what looks like the silhouette of Ant-Man and whoever is following in his teeny-tiny footsteps. So, who could it be? Iron Man is a prime candidate, especially as him being back on Earth would be big news. As would Captain Marvel showing up or a previously-dead character being un-dusted (that’s a verb now, I’m coining it). Marvel isn’t a stranger to making sneaky edits. Even as recently as the Spider-Man: Far From Home trailer we’ve seen Peter Parker’s passport have all mentions to years scrubbed out to hide whether it’s a prequel or a sequel. A spot of digital wizardry to hide someone who died in Infinity War or otherwise would be a big surprise (like Captain Marvel) definitely isn’t out of the question and helps build up even more anticipation. All this from a 30-second spot. Can you imagine what the actual movie is going to be like? Step right this way for a chance to watch all Super Bowl trailers that aired during the big game.